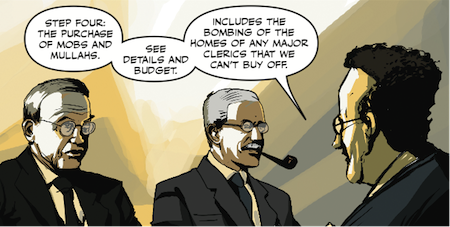 For our graphic non-fiction week, we present incomplete CIA documents juxtaposed with image excerpts from Operation Ajax: The Story of the Coup that Remade the Middle East. 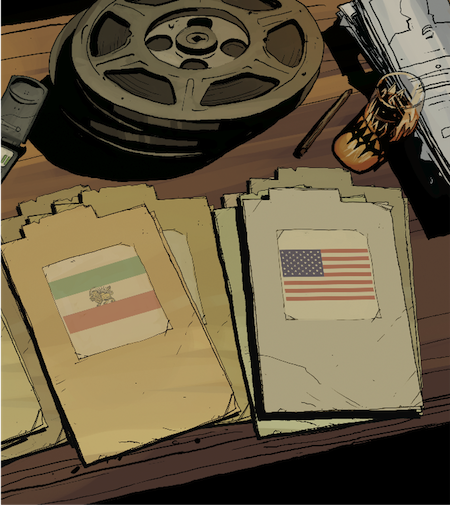 More than half-a-century since the 1953 Iran coup, code-named Operation Ajax, the CIA released some "top-secret" files. But as expected, most of the documents are heavily edited, with significant omissions. 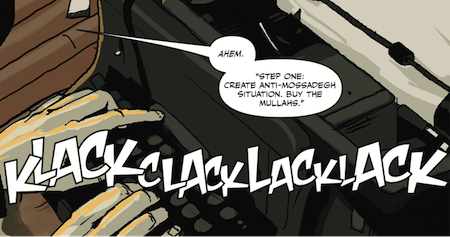 Mike de Seve and Daniel Burwen fill in what conspired in these blanks in their new work of graphic non-fiction Operation Ajax. Based on Stephen Kinzer’s All the Shah’s Men: An American Coup and the Roots of Middle East Terror, de Seve and Burwen's illustrations paint in lurid detail the callousness with which the West creates, topples and wages wars against sovereign governments. When the democratically elected Mohammad Mossadegh came to power in Iran and nationalised the country's oil resources, the British lost their major revenue and fuel source. The British did everything they could – from stalling any sale of oil from Iran to attempting to overthrow a democratic government – in order to regain their control and have a puppet ruler installed. 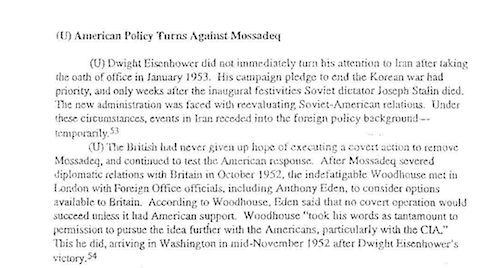 They needed the CIA to execute the coup and persuaded President Eisenhower to go back on the US's previously-held neutrality on Iran by alleging that communism was on the rise in Iran. 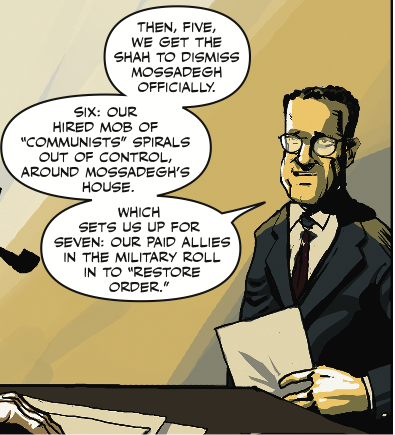 Operation Ajax decodes the many stories spun by the CIA and the British government under Churchill in order to oust Mossadegh, in the name of protecting "world freedom." The meticulously planned CIA coup unravelled successfully. Operation Ajax is essential to understanding the heavily excised CIA documents, which can be accessed here. Even in its internal documents, the CIA held on to the idea that America was indeed trying to dispel a communist threat and claimed to protect Iran's economy, while in actuality it was a coup to gain control over Iran's oil. The US government used the threat of Communism to give its newly instated CIA something to do. The mobs pretending to be communists were hired by the CIA in Iran. 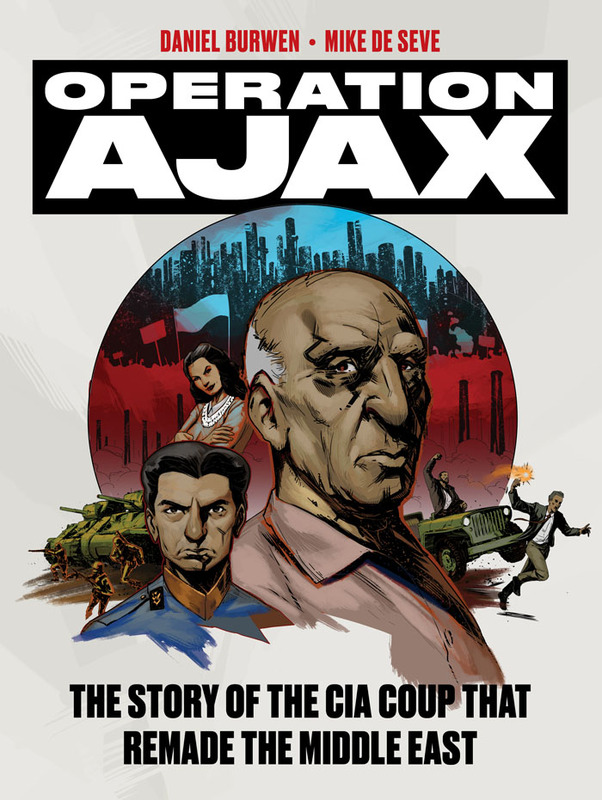 Operation Ajax is on 50% off through this week, till Friday, August 28. You can check out our other graphic non-fiction books on sale here.